ILLUSTRATIONS 120 TO 122.--Three strips of insertion, which are worked nearly like the ladder stitch. For No. 120, in tracing the outlines, make two small knots at short distances by winding the cotton four times round the needle, as can be seen in illustration; the windings are held down with the thumb of the left hand, draw the needle through, and a knot is formed. The outlines are worked in button-hole stitch only when all the knots have been made, and then the material is cut away underneath. Illustration 121 is a variety of the slanting ladder stitch. 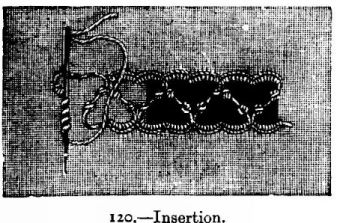 Illustration 122.--The cross threads are worked in two rows in the common herring-bone stitch, as can be seen by the black lines on the illustration. The straight lines at the top and at the bottom are worked in double overcast; lastly, the wheels are worked in a row as described for the star pattern, No. 104. 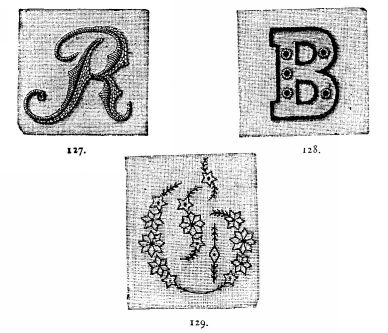 ILLUSTRATIONS 123 To 129 (Embroidered Initials).--To learn to work initials the Roman characters are the easiest to begin with. They must be traced and prepared like other embroidery in satin stitch, only the chain stitches underneath must not be too thick: it would take away the shape of the letters. All depends on the fineness and regularity of the stitches; they must be worked in overcast stitch. Work from left to right, and the letter when completed must look rather like raised printing than like embroidery. 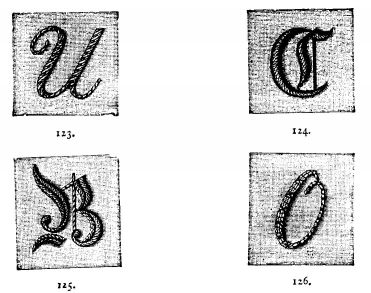 Gothic letters are much more difficult to work on account of the many flourishes; it requires great practice in needlework to embroider them well. Illustration 123.--The small black dots are worked in black silk on the thick parts of the letter: the fine strokes are covered with cross threads of black silk. Illustration 124.--The outlines of the letter and the fine strokes are worked in black silk. Illustration 125.--This letter is embroidered in raised satin stitch and point de plume. Illustration 126.--This letter is worked in back stitches, over which are worked at regular distances cross stitches of black silk. Illustration 127.--Letter in satin and back stitch. Illustration 128 to be worked in overcast and double overcast. ILLUSTRATION 129.--Letter G in point russe with black silk. ILLUSTRATION 130 (Embroidered Figures).--They are worked like the letters in point de plume and overcast; the dots are worked in knotted stitch.